Monkeys are expensive to house (you need a secure enclosure, proper permits, and sometimes additional insurance on your homeowner's policy) and feed; some even require specialized diets that can be time-consuming to prepare. A significant time commitment is also needed just for routine care and clean-up after a pet monkey. Most importantly, a monkey needs a large amount of social interaction and attention. 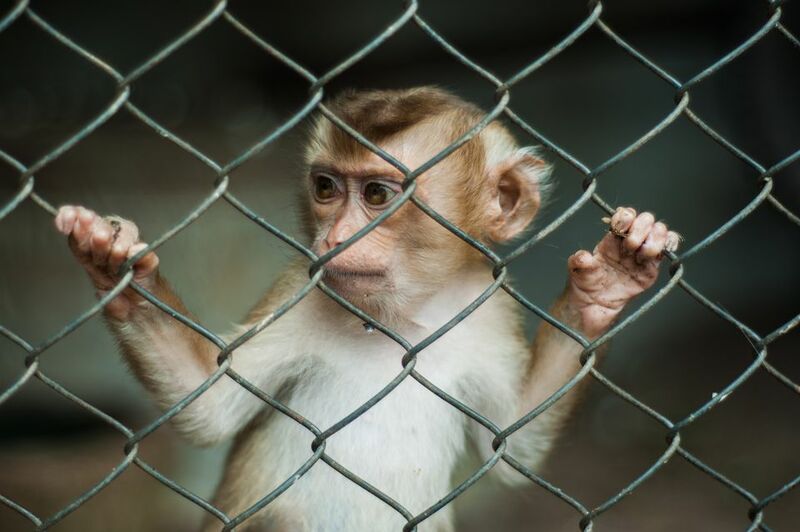 A pet monkey deprived of your time and attention will develop not only severe behavior problems such as screaming and biting but also psychological issues that can be difficult if not impossible to remedy. Primates including monkeys may be illegal to keep as pets where you live. If a monkey is legal to own where you live, permits may be required. Sometimes permit holders are subject to home inspections to ensure proper facilities and care are being provided. Homeowner policies may require additional liability coverage or insurance companies might cancel your policy altogether if they find out you have a monkey. However, not having insurance puts you at risk if your monkey bites someone. Pet monkeys also have a tendency to bite (and they have 32 teeth that deliver these nasty bites). While some monkeys are gentle, some are very aggressive. Even the gentlest monkey, however, is unpredictable and may turn aggressive on anyone including the person to whom they are the closest, especially during and after puberty. Monkeys are not clean and tidy. They can't really be effectively toilet trained; many younger monkeys can be diapered or at least partly toilet trained but that ability is often lost at maturity. They may engage in distasteful activities involving their feces and urine (such as throwing it and painting with it). Aside from the toileting messes, pet monkeys can be extremely mischievous and destructive, especially if bored. Monkeys need a large, secure enclosure and should spend time outdoors too if possible. They must be provided with a wide variety of ever-changing toys and exercise equipment to keep them challenged and stimulated or they will suffer from boredom. Some states require certain types of enclosures to fulfill permit regulations, but you should always have a place to secure your monkey to keep it and the public safe when you aren't with them.